90% biga loaf, as I learned from italian maestro Ezio Marinato. This means when you mix the dough, 90% of the flour is already prefermented. As a result we have a very digestive bread, also a lot of aroma and character. Shape. Final proof, 1 hour. Looks great. I may try it with more whole wheat to see how it comes out. of all the commercial-yeasted doughs. This one looks fascinating and has such a time advantage once the biga's fermentation is complete. It's a must try! 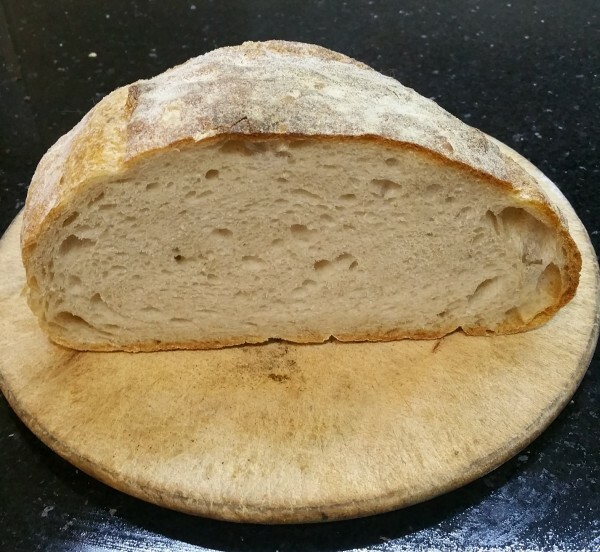 How do you find the character to be different when you use commercial yeast vs sourdough. I could guess, but with a 90% pre-ferment...who's to say! I've done sourdough biga two or three times. It's interesting. I encourage you to try it. 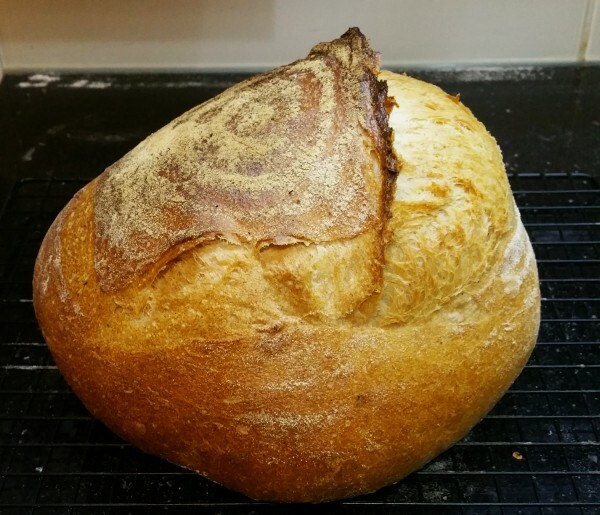 i do love sourdough but i think long slow fermentation is the key character component in bread....i make a mix of sourdoughs and commercial yeast breads for a saturday market - all are slow ferments whether with poolish, biga or sourdough. - all have great flavour, the smell of the preferments alone make you aware that time, temperature and patience are the key ingredients to a delicious bread....i also use a mix of wholegrains in my preferements which gives deeper flavour and a kind of back note to all the bread.....as for a 90% prefermnt - i have to try that - i usually use 50% max. If it is 900g of flour and 405g water for the IDY version, that works out to a 45% hydration biga. I don't recall ever seeing a biga or any other bread with so low a hydration, and I can't imagine how it is possible to incorporate the water and have the biga dough saturated. How does that work? Is the levain version using a 100% hydration levain? Overall the IDY version works out to ~70% hydration, which should be just fine. What is the baking temperature? Hydration in biga is 45% to 47% of the flour. So for 900 grams of flour, 45% is 405 ml of water. You don't need to create a dough, it's just mixing one minute until all the flour is wet, like when you make crumble. You just have to create some wet flour threads. Shouldn't have jumped the gun and guessed. Thank you for the correction. Italian flours, like fairly common in the US, Caputo's chef's 00 often do no absorb water all that well. 45% with it may well feel like 60% with a regular flour. And when you say "bread flour", do you mean what the U.S. refers to as bread flour? You need to use a strong flour (12.5 to 14 proteine). Think that this flour must be fermenting 14-16 hours at 14-16 degrees C. If you use a week flour, it will be very degradated after this process. You can use a weeker flour not in the biga, but in the rest of the formula. Hi friends. There's a lot of misunderstanding with Biga. In most of the books it's not well explained. I also had a lot of confusion until I attended to some courses with maestro Ezio Marinato and many other chefs in italian bakeries. Hydration in Biga is between 45% and 49%. Depends on how strong your flour is. Biga is not a dough. Biga contains litlle water so it doesn't arrive to be a dough. The texture must be like a crumble. That's why it's important to disolve the yeast in water, and then add flour. If you use mixer, and you work with small quantity, maybe 1 minute at slow speed is enough. If you are working with great quantity of dough (3-4 kilo or so) maybe you mix 2-3 minutes. But it's important not overmixing. Just create some threads of wet flour. That's all. The main difference between biga and poolish and sponge is this one: when you make poolish, it grows and it's full of bubbles. When you make sponge, it also grows (2 or 3 times in volume). Biga, after 14-16 hours of fermentation, reamins the same volume, it doesn't grow. It only looks like a wetter dough, but the volume is the same. The only difference is the smell and the aroma. It's also important the temperature. Italians are very strict in this item. 14-16 hours at 14-16 degrees C. In most of the itaian bakeries there's a cellar with this temperature (aprox). If you cannot be sure that you will be able to keep this temperature, specially in summer or spring, you can use some salt to control the fermentation during the biga process. Biga: 990 strong flour (bread flour or Farina 1, or T80 wheat stoneground flour) + 445 ml water + 3,3 instant yeast or 99 grams of sourdough. Final dough: All the biga + 10 grams flour + the rest of water we want + 20 gr salt. If you want to learn more about biga, I suggest you to follow italian bakers like Ezio Marinato. If you visit Venice, you should take a Uber and meet him in Cinto Caomaggiore, 20 minutes from the city. I shouldn't have used guess work (as above). Learn something new everyday. Lovely loaves and will certainly try your method. Check this site for biga infomation. This is where I learned about biga many years ago. I have shared this wheneven someone talks/asks about biga in this forum. :) It has lots of info about Italian bread, quite helpful. The classical formula for the Biga: 42-46% of water), cool (64-68 F), and made active by a dose of yeast (1%). The rest time of the biga is commonly from 16 to 18 hours. It also provide four ways to prepare biga. Hi friend. Interesting. That's not exactly what I learned from maestro Ezio Marinato, but I understand every chef has its own method. What I learned from him was in several courses I have made with him. It is also explained with lots of details in his book Farina d'Autore. What weight are your loaves and at what temperature do you bake them and for how long? something similar when things go wrong with a shaped proof in the fridge. If it too far gone i will add 10% more flour and water and just proof it again. 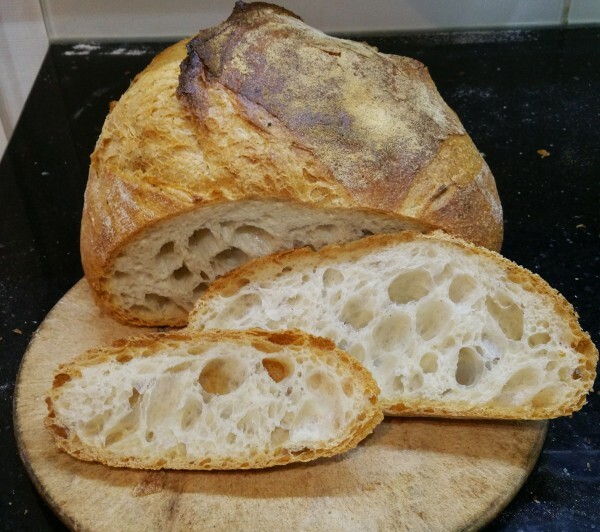 The crumb is less open but the flavor is always great!. Nice bake and thanks for the tutorial. Thanks for the lesson in biga! This recipe is high on the try it list now that I have a workig starter. How did you score your lovely boule to achieve the open circles? Thanks and Happy Holidays. I have many knives for scoring bread. Depends on what I want to achieve I use one knife or another one. This was made with the orange one. There’s a discrepancy here- recipe above has 0.3% yeast and 2nd recipe has 1% yeast - any thoughts on which it should be? Yeast in Biga is usuallly 1% of the flour (fresh yeast or 0,3% if it's instant yeast). For 900 grams of flour would be 9 grams of fresh yeast or 3 grams of instant yeast. For 990 grams of flour would be 9,9 grams of fresh yeast or 3,3 instant yeast. The consistency and the appearance of Biga, once is mixed, should be this. Then just leave it in a vertical container, covered with a kitchen towel, leaving a little open, so Biga can breathe all night long. The old saying "a picture is worth a thousand words" applies here. This picture is a lesson all its own. Been 12 hours and two more to go before the final dough. From your description and success. That's what fascinates me too about bread baking. Same ingredients but tweak the method and you get a different bread. This Italian Biga method is new to me so hopefully I'm doing it correctly. Must say it was a tad difficult to not over knead when making it. With an autolyse but then couldn't get rid of the lumps so I too was afraid this would happen again. Don't know if what I did for the biga was too much or not but I'm also doing everything by hand. Time will tell. The weather for once is in our favour. I need a lie down. Dough made. Dissolved the salt in the water, poured that over the biga then added the whole-wheat flour. As I was incorporating it all I thought it was all going south. As the biga came apart I could see the gluten strands. But eventually it came back together again and made a good dough. Did my best to get rid of all the lumps and by hand that's not easy. Now I'm going into the bulk ferment and I'll give the dough a stretch and fold every 15 minutes. The lumps are a nightmare but you’re on easy street now - there must be easier way that’s why in retrospect I thought hydrating biga with water for a while would help minimise lumps - I put my dough into steamed microwave for little over an hour with a stretch and fold - then preshape Rest shape and proof just over an hour and then delicious bread....surprised at vigorous fermentation - it’s such a yum bread! Yes indeed. I've been paralleling you and Abe on this. Mine came out of the oven 10 minutes ago. I'll post a blog entry later today on the trials and travails, and lessons learned! Looking forward to your results Alan. The crust is strange almost plasticky and I'm not sure it's worth all the extra effort. I've gotten better flavour in other sourdough I've done. Mine has a lovely crispy crust and nice interior, although not all that open a crumb (which doesn't really bother me all that much). 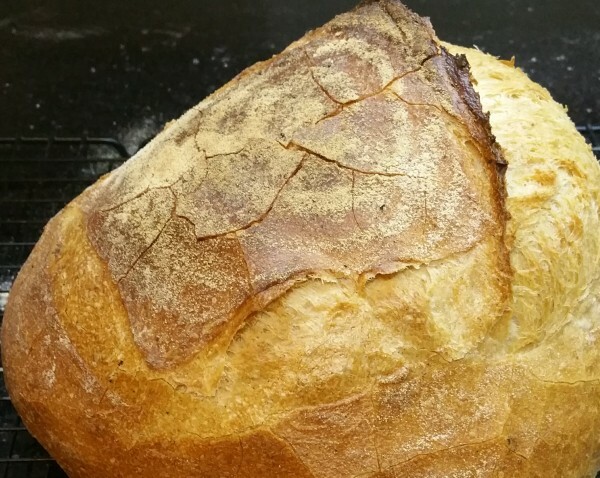 The flavor was pleasant, but agreed, a lot of other SD breads have a more distinctive taste. However, not willing to throw the baby out with the bathwater and I'll likely return here again, because the entire experience was a worthy endeavor and something new and quite different. There is nothing wrong with the flavor, but for a long long retard of the majority of the dough, I was anticipating a better payback. Then again, it is totally possible that we don't really have a grasp on this beast and it is a learned skill to eke out the true flavor. A nice enough final loaf but I was expecting, for the effort, a "better payback". I'm in two minds... 1: dive straight back into it and learn how to get the best from this process. 2: have a little break, learn more about it, and come back to it. Mutantspace likes it and had success with yeast so that's also an option. I'm going to try and find videos. I want to try it again with dried yeast I'm just a bit reluctant and I'm not sure if I have the strength at the moment. I didn't enjoy the biga process and wasn't impressed with a lumpy dough. Not nice to work with and if I'm to enjoy a bread it has to be a good all round experience. Perhaps I'll try again in a few weeks. I tried it with with yeast and mixer. Mixed 16 minutes with KA #3 setting. It took that long before it made a ball and released from the bowl sides. Still had small 1/4 inch nuggets in the dough. The dough hook just moves them around rather than breaking them up. Crust and crumb were good and nice taste. Used DO at 450F. Use the paddle instead of the hook. Lowest speed. Start with just IDY already mixed into quite warm water. Nothing else. 1/4 cup by 1/4 cup add the flour. Allow it to become incorporated before adding the next 1/4 cup. When the dough balls up on the paddle, which is a likely guarantee, stop the mixer and strip the paddle, give the dough ball a few light squeezes and continue. The majority of the dough should be "crumbly" incorporated before that happens. Refer to Abel's picture toward the top of this thread for what the dough should look like when you stop mixing. Anyway, that's just a somewhat educated guess. Thanks for the info. Actually, I mixed the biga by hand to achieve the crumbly dough shown in Abel's picture. The next day, I then used the mixer to try to mix the last 100 g of flour and water into the 45% hyd dough crumbles. I chopped up the biga into small pieces, maybe each the size of a ?watchface? across. I put most of, but not all of, the water into the mixing bowl, holding back something like 30% or something like that. Turning the mixer to the slowest speed and never beyond that, I started to add piece after piece of the biga, waiting for it to become saturated and then start to break down in the water. Assisted by an occasional squeeze of the hand. When the slurry became too difficult and the dough started creeping up the paddle, I added more water, a little at a time. Eventually the paddle must be cleaned off from the accumulating ball of dough. A few times. But this was a pretty successful endeavor. Once the ingredients were fully incorporated, I then proceeded to hand mix the dough in my usual way - French Folds. Is the starter hydration important? If using an active starter, what hydration level is the starter? Is it like a bread dough or like pancake batter? Should I compensate so the biga crumble maintains some dry flour as seen in your picture. I keep my starter at about 125% so I describe it as a thick pancake batter-not pourable but still settles flat in the jar. I don't bake too often anymore so I keep my starter refrigerated, feed weekly and make it very active by feeding 3 or 4 times the day before I want to use it. 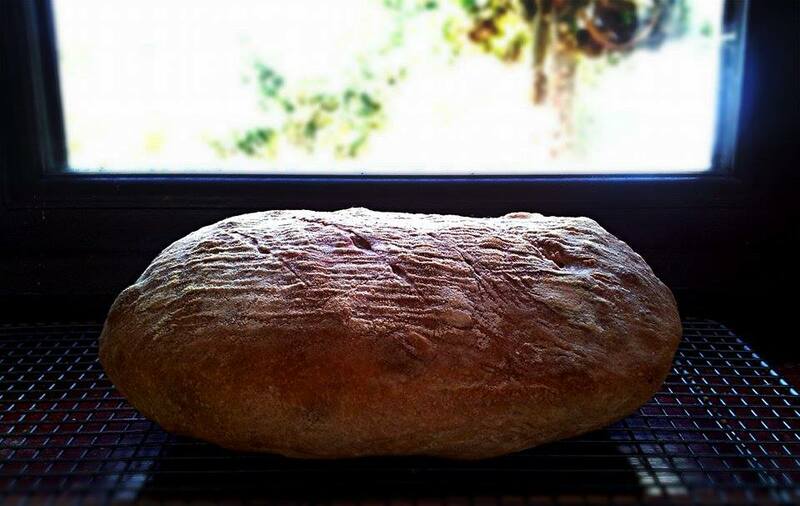 I usually use a poolish so the biga method is different to me and sounds intriguing. Thank you for the great explanation! I usually avoid using bread flour because of the chewy texture it lends to the crumb. BUT, this is so highly fermented and Abe's original comment was that a weaker flour would be too deteriorated by the long fermentation. I am prepping my starter to make this but they have been a bit neglected lately so it will take a while. So-for those who made this-was it a "bread flour" type crumb or more tender? It certainly has some chew so don't expect the lightness of crumb that, for instance, a good fresh yeasted baguette would provide. OTOH, I like my bakes on the darker side. Clearly the vast majority of my bakes do not have the girth of a large batard or boule, so they may exhibit a little more chew than otherwise. But once you get to the toast phase of the bread, it will be delightful! Yes, it's incredible how biga works. Of course, you can use less biga in your bread, but then you cannot feel the flavour and the real aroma of a biga bread. 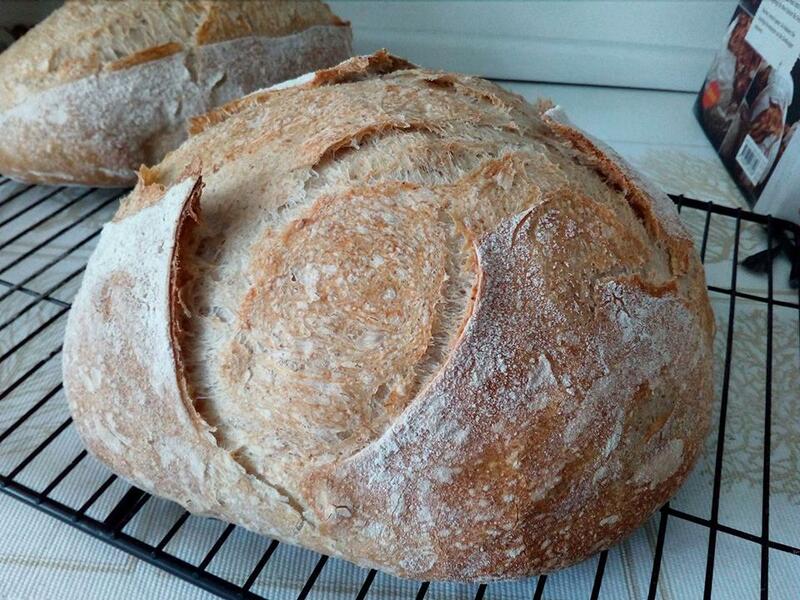 I had a teacher that once told me there are two flavours and aromas which are unmistakable: sourdough and biga. And that's true. 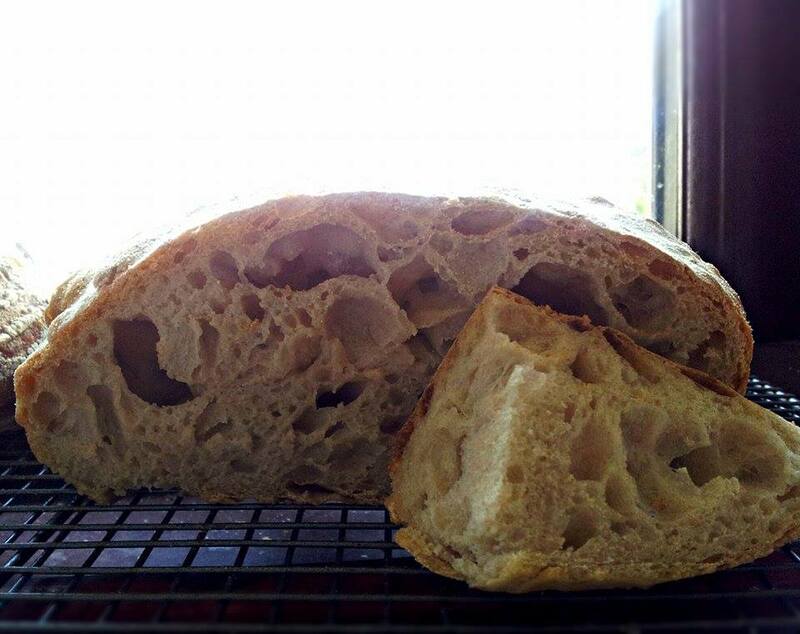 I suggest you also to try the sourdough biga method. Now it's good time to make it. Temperature now in kitchens is the ideal for biga fermentation (14 to 16C). When you make biga bread, one of the common items is how do I incorporate the remaining water in the biga. Simple. Begin adding only 2/3 parts of the water and mix in slow speed. When the gluten net is made, then pour the 1/3 of the remaining water, litlle by litlle. You can use this biga method for all kind of hydrations, from regular bread (65% hydration) to italian ciabatta (90% hydration). Usually in italian bakeries they use strong flour for biga. This is because you require a big quantity of proteines to survive after a 14-16 period of fermentation. You can use a weaker flour for the remaing part of flour in the recipe (spelt flour, ancient grains flour, multicereal flour, etc). I am happy you are excited with this method. I was quite intrigued by Abel's description and picture and I have usually found his recipes easy to follow. I trued to make the bread as described with 90 g active rye sourdough. The overnight temperature was spot on, 15 degrees Celsius. As the others described the biga contained a few hard lumps. I used a mixer with the paddle attachment as suggested. After I had added the water, salt and remaining whole wheat flower in the morning I found the dough to be very wet and sloppy. I did 3 S&Fs in the bowl over the next 90 minutes after the initial mix. Then I divided the dough and placed it in bannetons. I noticed right away that the dough was very wet and I couldn't really shape it. After an hour's rest I baked the loaves one in a dutch oven, the other in a cloche. For some odd reason the dough in one banneton seemed to rise a bit better than the other and that bread ended up in the dutch oven and gave a decent rise. The other one, in the cloche, remained rather flat without nice oven spring. In both cases the loaves had remained very soft and floppy, and I had trouble inverting the bannetons and placing the loaves in their respective vessels. I haven't tasted them, yet. For me the resulting high hydration dough was hard to handle and I suspect that I should have proofed the bread longer. When you add the remaining water it's good to pour it little by little. This helps the water absortion. The bread was also under proofed with a few rather large holes and the rest of the crumb dense. I like the taste, though. IDY hydrated in about 50ml of the biga water heated to 44C for 5mins before mixing with the rest of biga water in the mixer. add in biga chopped up into small pieces and mix until incorporated - around 15 - 20 mins on slow! add in salt, mix in and then mix dough on high for 7 mins. Personally, I wouldn't attempt to make this bread by hand, as I think the mixing in of the biga would be problematic as others have found. Perhaps the best way forward there is to up the hydration of the biga. Many thanks Abel, for another great recipe! I though I was on a roll with Biga bread, so I decided to try a hybrid version with an SD Biga and idy added to the main dough to give a sensible proof time. I used 60ml SD starter in the Biga as I was going for a 24hr ferment and added 0.2% idy to the main dough, hydrated as in my previous post. Everything was looking good, but the end result was a big disappointment, with poor oven spring and a tight dry crumb. It just shows how you can't always predict the end result even though you think you are following good baking practise! Next time I think I'll add some ripe levain to the main dough instead of the idy and see if that improves matters. Wow what a loaf! The smell of it is amazing. My entire house was full of aroma. I over handled it just before baking and knocked some of the gases out of it, i was gutted as it would have been spot on otherwise. One of my fave recipes. The crumb stays moist for days and the bread slices are flexible and do not fall to bits despite some pretty big holes. I baked version 4 last week.